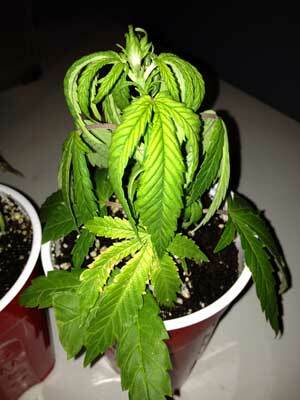 Problem: After watering, your plants start drooping. 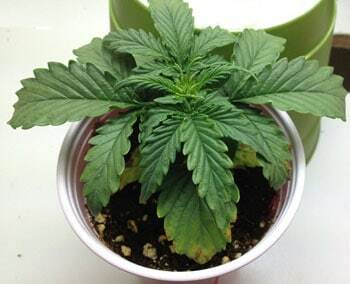 Usually the droopy leaves will feel firm and appear curled down (the whole leaf will be curled, not just the tips, which is often a sign of nitrogen toxicity). 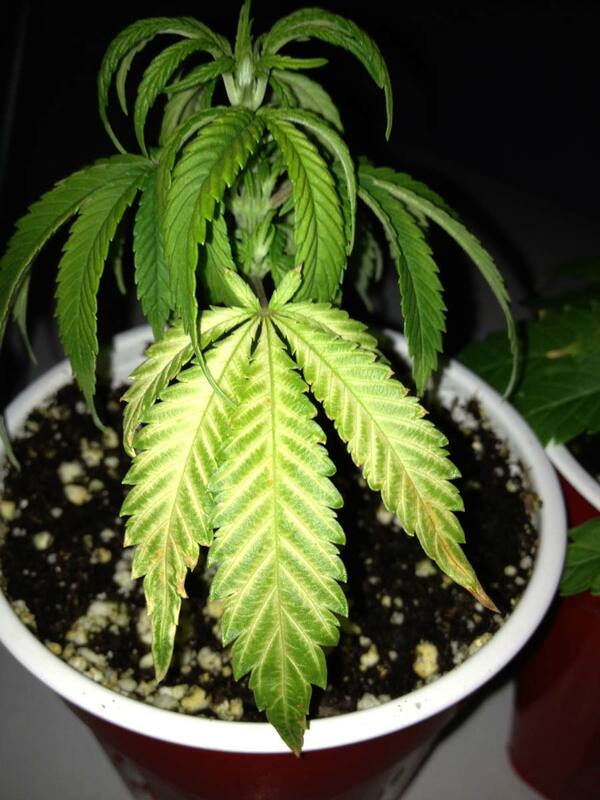 With overwatered cannabis plants, you may also notice Chlorosis (leaf yellowing that is similar to a nitrogen deficiency). 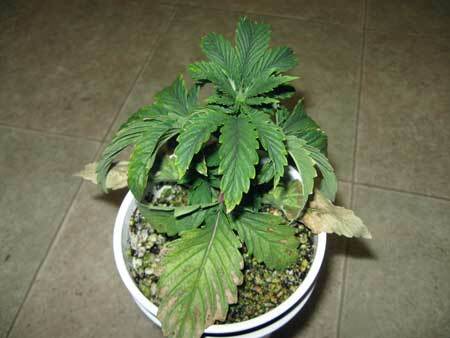 Overwatering does not always mean you’ve been giving the plant too much water. 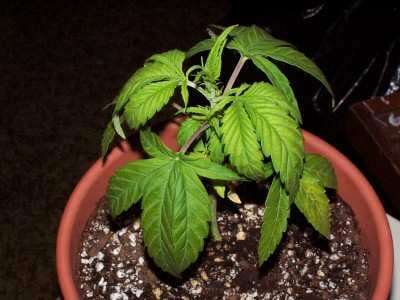 It can also mean that you’ve been giving the plant water too often, or growing plants in a growing medium that holds onto water without enough air, or doesn’t have good drainage out the bottom. 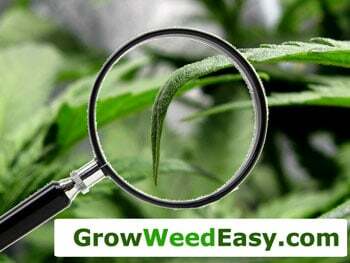 How Often Do I Water My Cannabis Plants? 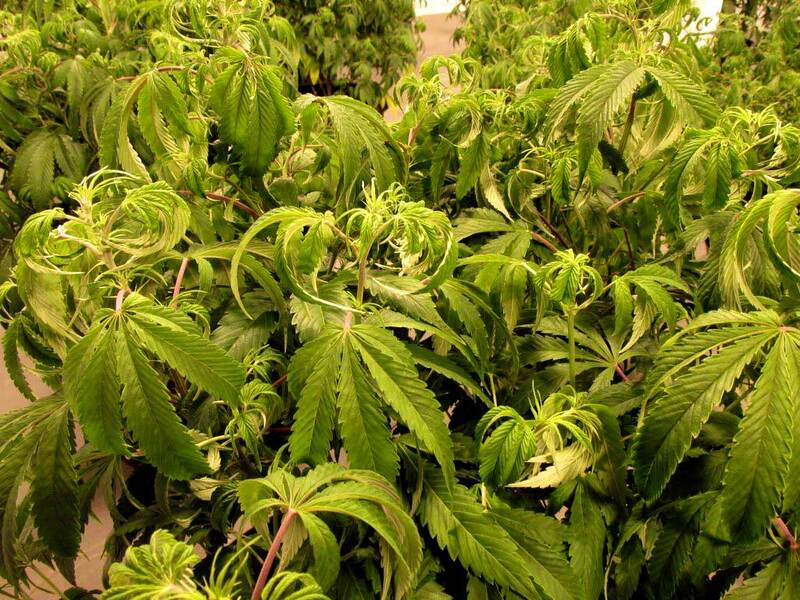 Cannabis plants use their roots to get oxygen, almost like they’re breathing. 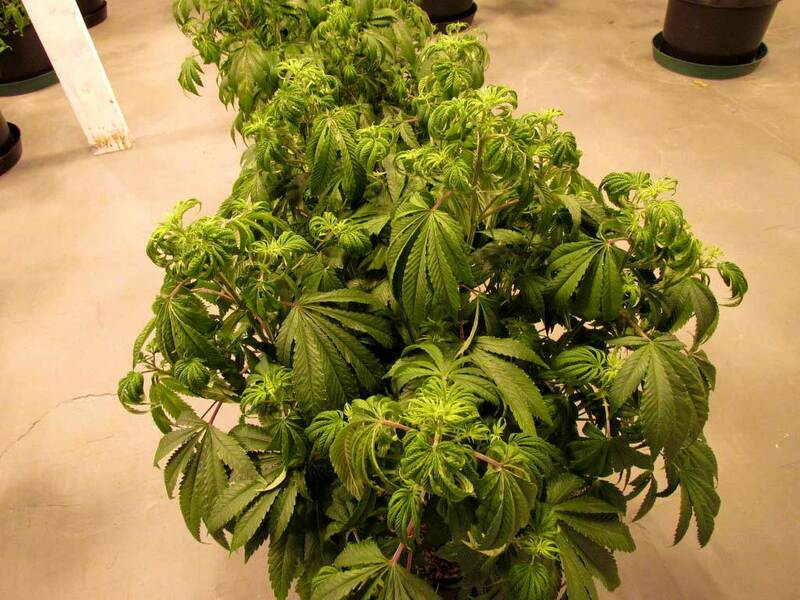 Oxygen is dissolved in water, and there’s also air pockets in their grow medium to provide a source of oxygen. When you water your plants too often, the roots end up sitting in stagnant water. The reason your plants droop is because basically their roots are starving for oxygen. 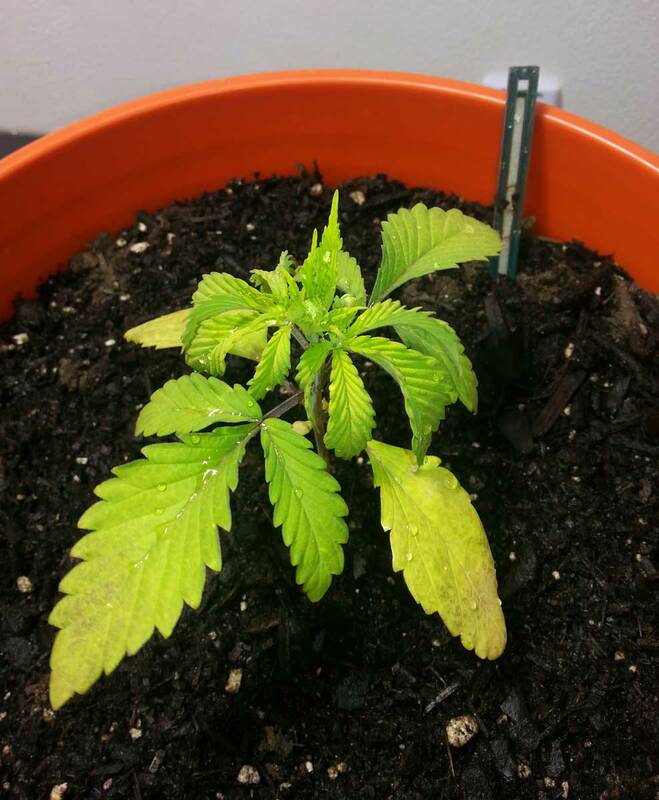 This sick marijuana seedling has several symptoms including droopiness and leaves with brown spots that appear to be a nutrient deficiency. Surprisingly, the true cause of both problems actually is the thick, wet, muddy soil. 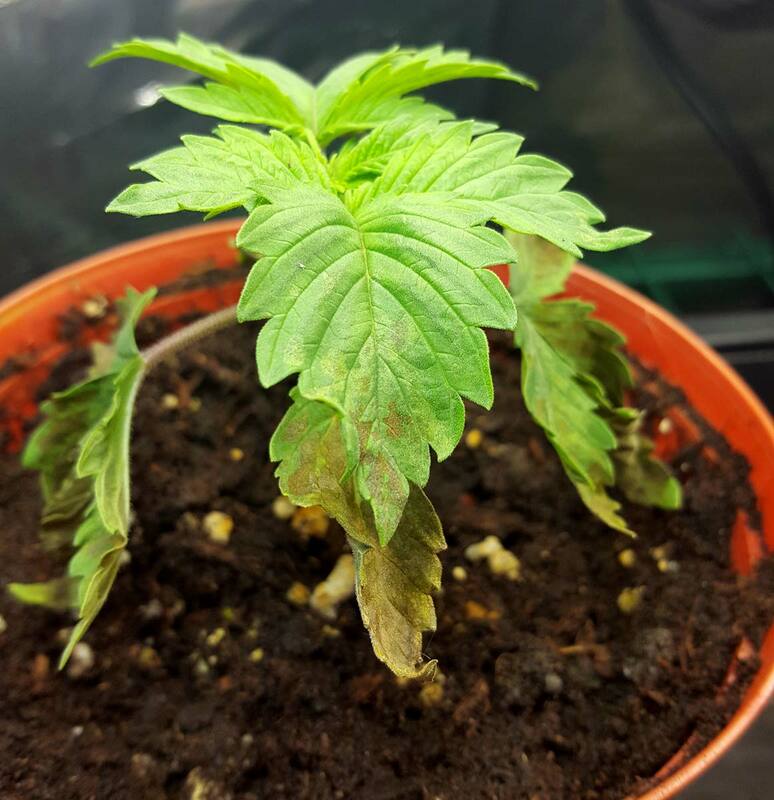 The main sign of a cannabis plant being overwatered are the droopy leaves, though other symptoms often appear around the same time! Solution: The best thing you can do for overwatered plants is give them time between waterings, and then start off watering slowly until things seem back to normal. 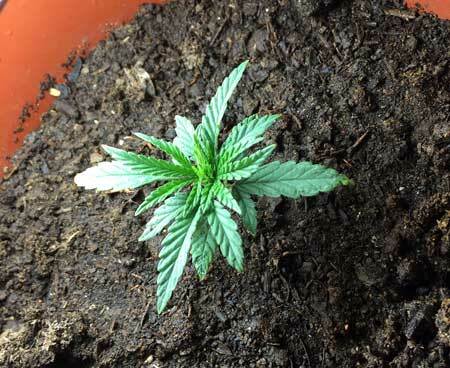 Make sure that water is able to drain easily out the bottom of potted cannabis plants. Be extra careful with small plants in big containers. 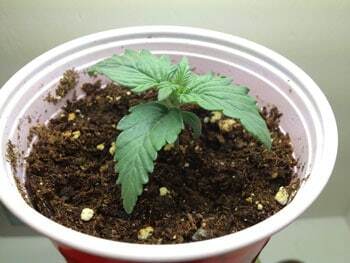 Add water until you see some at least 20% extra runoff water drain out the bottom of your pot. Go back to step 1. If top of growing medium stays wet for a long time, you may need to give your plants less water at a time, or improve your drainage. The goal is to be watering your plants every 2-3 days. If it needs longer to dry out, you should be giving less water at a time. If it’s drying out too quickly it should get more water at a time (or may need to move to a bigger pot). If your plant medium seems to stay wet for a long time (more than 4-5 days or so), you may need better drainage. 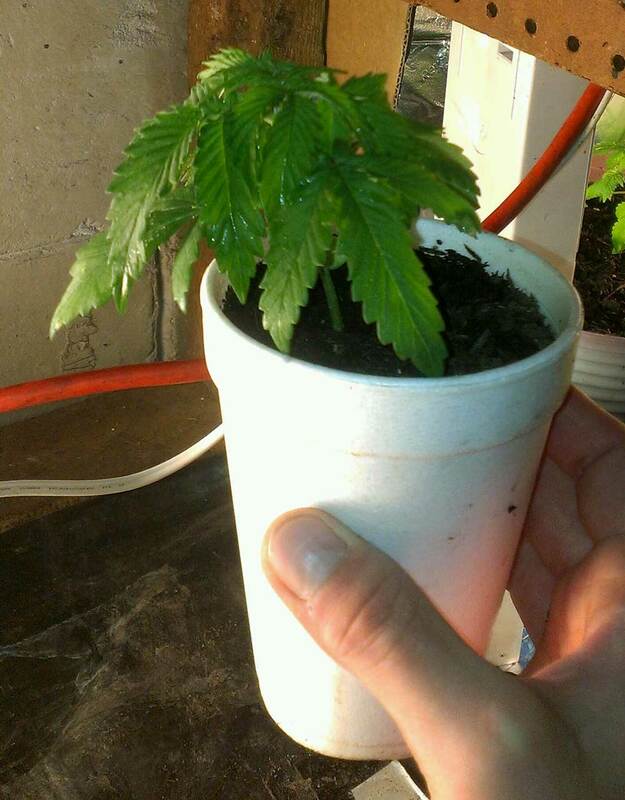 This also can happen when growers put tiny plants in a pot that’s way too big. 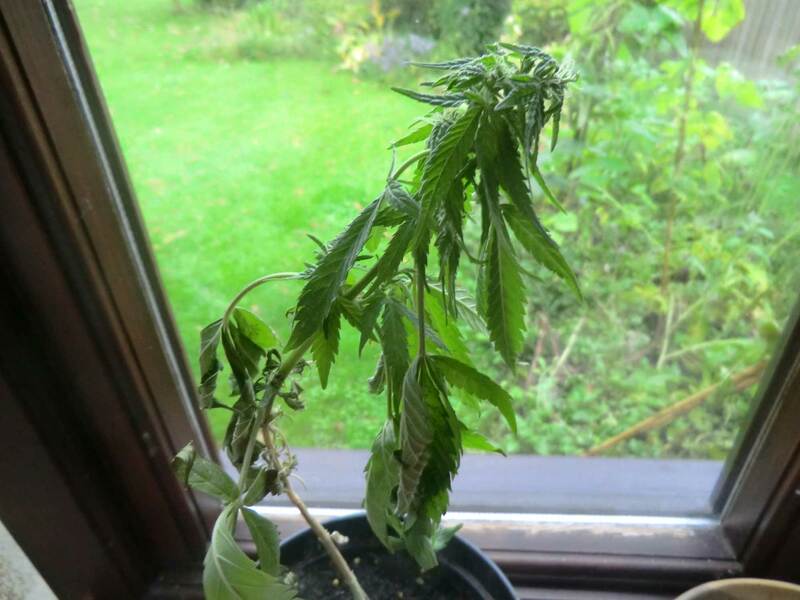 This cannabis plant has green healthy leaves, but as a result of overwatering it’s stunted and small even though its more than a month old. Make sure that water drains freely from the bottom of your container (it’s recommended that you provide enough water to get at least 20% extra runoff every time you water your plants as long as your plants are drinking well). You should see water coming out the bottom within a minute or two after watering. Then don’t water your plants again until the soil is dry up to your first knuckle. If your plants are already overwatered, you can try to increase the temperature and airflow to help the water evaporate more quickly. You can also use a pencil to gently poke some air holes into the growing medium to provide extra aeration and oxygen to the roots. Whenever a seedling has droopy leaves, it means that the roots are either not getting enough water (underwatered) or not getting enough oxygen (overwatered). 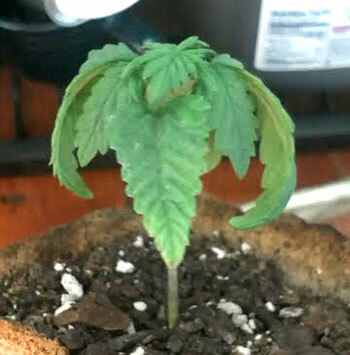 This seedling has been chronically watered too often, preventing the roots from getting enough oxygen. As a result, the seedling has stayed small and mostly stopped growing. 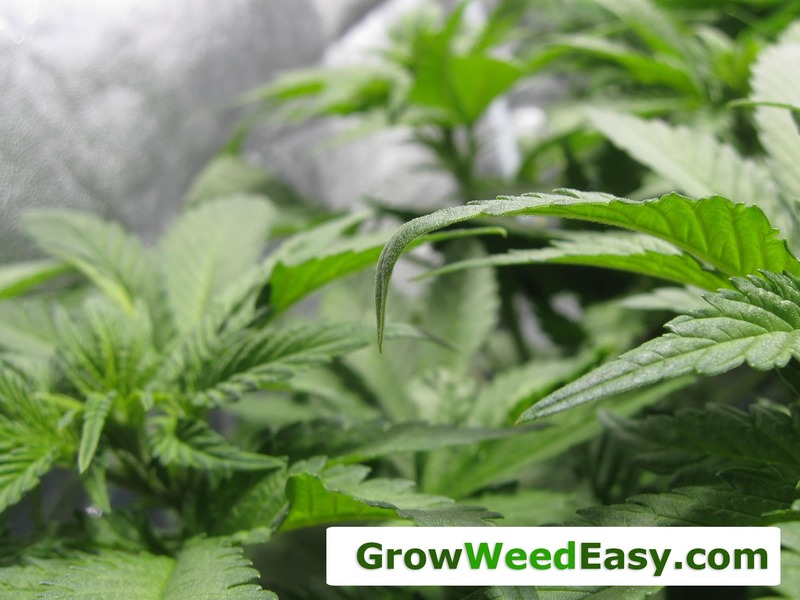 For your individual growing medium and environment, your watering method will vary, but if your plants are drooping and you’ve been feeding them a lot of water, it’s a good idea to cut back and see if that helps. Sometimes plants will be droopy no matter what you do, and the true cause is the plant is rootbound and needs a bigger container! 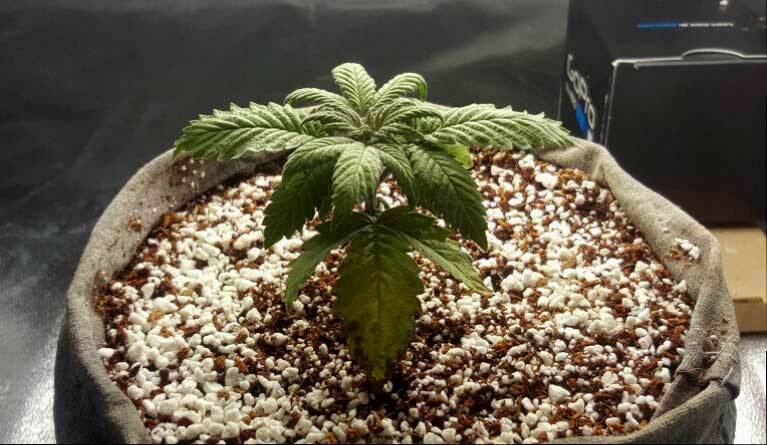 If you’re growing hydroponically with your marijuana roots directly in water and you see the signs of overwatering, that means you have a problem at your roots. Either your plants have root rot which is preventing them from getting oxygen at their roots, or you are not dissolving enough oxygen into the water (you can easily increase the dissolved oxygen in your water with a quality air pump and a few air stones). If your plant is experiencing “the claw” and not just normal drooping (the ends of leaves are curling like a claw or pointing down like talons), then you may actually have a nitrogen toxicity (too much nitrogen). Am I under-watering my cannabis?